In this episode, drama over whether or not Takuya will kill Tommy, followed by drama over whether or not Takuya will save him. Even though the series is linear, with each week leading straight into the next, it's rare that an episode's quality hinges on what comes before it. An episode could be absolute crap, but as long as it tees up a big dramatic battle or plot event, the next one isn't going to suffer because of it. Here we have a rare case of an episode hampered by the previous episode's problems. It puts up a good fight, but when forced to carry all of the last round's baggage along with its own, it can't support itself. We can't be too harsh on this episode, but it makes me dislike the last one even more. By far, the most dramatic moment in this episode is a spirit-less Tommy running in front of BurningGreymon. Takuya's mindset lapsing in and out of control is presented well, showing him realizing that he's attacking his friends, only to lose focus upon seeing that his friends are attacking him too. This is a nice touch, as it shows that it's not that easy to take the reins as one errant thought screws everything up. This makes it pretty intense when Tommy throws himself at BurningGreymon's mercy, and also allows us to buy how this allows Takuya to regain control. Obviously, Tommy's incapable of fighting back. It's a solid moment for Tommy, and reinforces a message that witnessing bullies and being too afraid to do anything isn't much better than being a bully yourself. Takuya doesn't have it completely down: after releasing Tommy, BurningGreymon smashes his head against a rock repeatedly in an act that just screams “Hey Tamers, we can do Evangelion references too!” The encounter was good, but seriously belonged in the previous episode. In what seems like no time at all, Takuya's forced to give it another go. This time, he's so successful that it's anti-climactic. The angst over these beast spirits is so short that it feels inconsequential. Now, if the last episode had taken care of this disastrous first evolution instead of wasting all its time on all that Shamonmon fluff, the first half of this episode could let the drama simmer as some real fears crept into Takuya's head. He'd have time to think, which means he has time to doubt, which is dangerous. It's not that Takuya doesn't worry about having to try it again, it's that he doesn't worry enough. 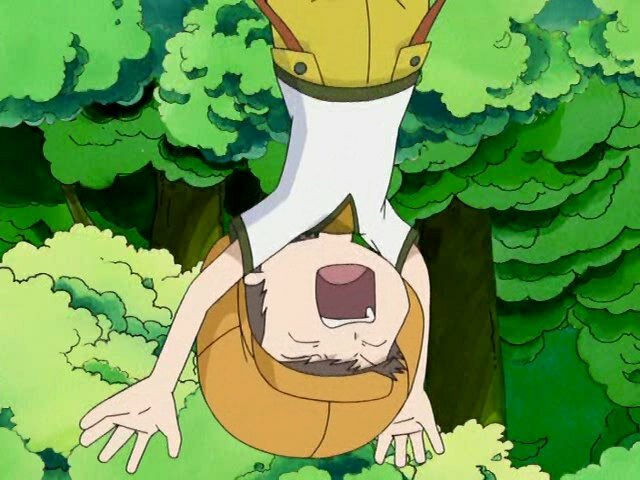 When everybody else is incapacitated, Grumblemon steals Tommy, leaving Takuya with no choice but to try again. 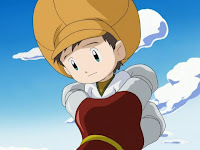 He controls BurningGreymon easily, beats Gigasmon easily, saves Tommy and even takes the spirit of ice and the beast spirit of earth for good measure. The battle is plenty good, but without an emotional impact as Takuya's conflict is introduced and wrapped up in one tidy episode. Hell, he even has a flashback from earlier in the same episode, which is just silly. The reason why everyone else is incapacitated, of course, is not the previous episode's fault. It is, quite simply, one of the stupidest traps ever created, and the kids are complete idiots for allowing it to work. Picture yourself in a forest, knowing there's an enemy in the vicinity. You see a hill with tree roots organized like an amida-kuji game. At the bottom, you see a number of Xs and one O. So do you sense a trap and either rig the game so everyone lands on the O (or, even better, not play at all and go around/over the damn thing)? No! Everybody pick a line and let's see who wins! YOU MORONS! This is even worse than the Adventure kids falling for the siren of free food every other episode. On the plus side, at least the group came to their senses about heading for the Forest Terminal without Zoe's spirit. Hopefully this indicates a willingness to never listen to Bokomon again. Does anyone else love the fact that the title for this episode in a kid's show is a direct reference to a movie all about ridiculous amounts of drug use? 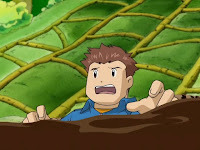 While BurningGreymon is fighting KendoGarurumon and Beetlemon, occupying three-fifths of the team, Bokomon suggests that Zoe and Tommy run away. What the hell is that going to accomplish, other than rendering Zoe and Tommy more irrelevant to the war than they already are? 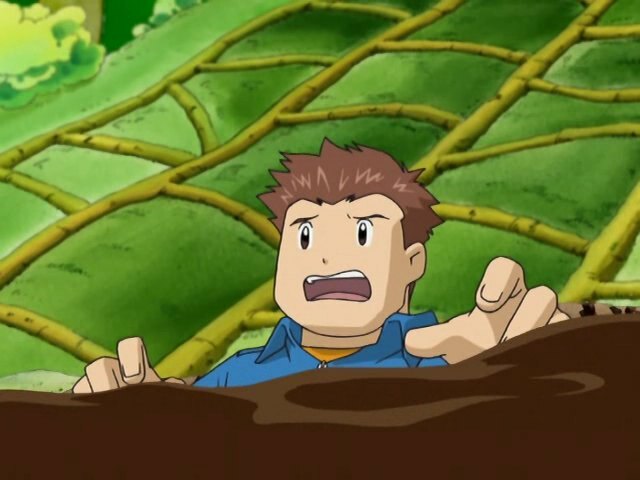 Most of BurningGreymon's cries sounds like Takuya yelling a lot. Then every so often he has this straight-up Godzilla scream. It's frightening and I wish they used it even more than they did. The group just had a nasty experience that drained everybody physically and emotionally, but Zoe jokes that she'll be targeting JP when she gets her beast spirit. Considering that JP actually was attacked, is this really a time to be joking? Grumblemon has the spirit of the Legendary Warrior of Earth. He tunnels through the ground like nothing. Yet Takuya forgets that he's capable of earthbending?! The way Grumblemon greets his three allies is so formal and so obviously audience-oriented (“____, Warrior of _____? !”) that it's downright inappropriate for his character. Which is another way of saying that even with nothing more than one-line introductions, I already like all three of these new guys better than Grumblemon. A nice touch was Zoe actually commenting on the "Godzilla scream", saying that "it doesn't even sound human". It gave more meaning to the fact that they become digimon. "Hell, he even has a flashback from earlier in the same episode, which is just silly." Ah, this season is rife with these ridiculous flashbacks. It never seems to be for anything other than to fill up time, given how frequent, long, and insultingly recent they tend to be. This entire episode was fanatstic! The begining was a bit disappointing cause I was expecting a 'Burninggreymon vs kendogarurumon fight and instead is mostly just Takuya vs JP. -Now she's been demoted to *background* eye candy.